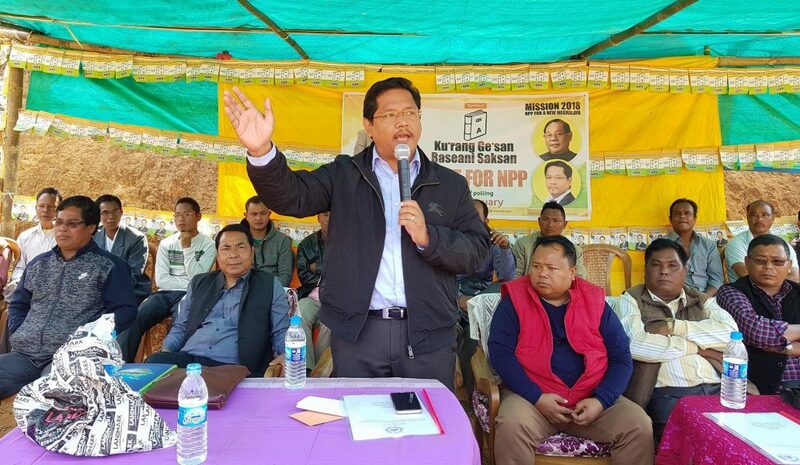 Conrad Sangma speaking during an election campaign at Dagal. National People’s Party (NPP) president Conrad K Sangma on Friday came down heavily on Chief Minister Dr Mukul Sangma stating that the Meghalaya CM has been selling false dream by hiding facts in what he speaks. Addressing a number of election rallies under Songsak and Rongjeng constituencies, Conrad, who is also the Tura Lok Sabha MP, fired salvo at Mukul Sangma for branding him as a “memorandum MP”. The Tura MP also said that he is concerned about his people and would continue to raise issues and concerns with the Central government which is his job. 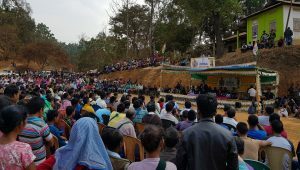 In an attempt to strike cord with the electorate of Songsak constituency, the NPP national president also said that their party would usher in a positive era in Meghalaya. “People of Meghalaya have suffered a lot under the Congress regime. It is time for the people to be conscious of their rights and vote for a government that would ensure them a secure, independent and condusive environment for growth and development,” said Conrad Sangma. Crowd at Conrad Sangma’s election rally. Conrad also assured the people that their party would embark on the single agenda of growth and would ensure equal opportunities for all the people of the State. “We, as a party would ensure that the momentum of growth is not region-centric. We have chalked out a strategic plan for holistic development of Meghalaya,” he further said. He also said a ‘scared’ Mukul Sangma was making all attempts to harp on his “so-called ambitious plan” of development, “which is nothing but attractive trailer of a flop Bollywood movie”. “The people have lost their trust on the Congress. Let him (Mukul) try whatever he can but this time we will ensure that people are united to dethrone them from power,” he added. Alleging that Mukul was trying to satisfy his ego by contesting from Songsak constituency, Conrad said, “In 2016 Lok Sabha bypolls, Mukul had said he would wipe out NPP from Songsak and Dadenggre but it was only his wishful dream. He (Mukul) is now trying hard to retain even Ampati; so he is contesting Songsak. March 3 will demonstrate that people are not willing to accept him neither in Songsak nor in Ampati,” he asserted.